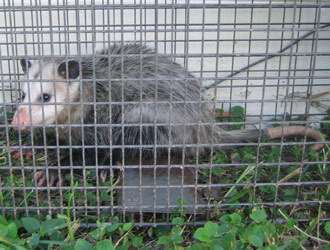 Opossums are a common nuisance animal in southeast Georgia. In Atlanta and Fulton County, possum have become a particularly common problem, as they have invaded many homes in the area. If you need a professional solution for your Atlanta possum problem, give us at A Wildlife Pro a call. I need you to ID some droppings. I believe they match the description of opossum droppings, but since they are in the crawl space under our home, we need to know so we can figure out when the critter would be gone so we can block off the hole it has created beside the duct behind the heat pump. I stuffed the hold lightly with plastic shopping bags yesterday, and so far that has not been disturbed. The hole is not apparent outside the wall in the soil. Would they have a tunnel from farther away? We have plastic down in one corner of the crawl space because we use that area as our safe spot during storms. Unfortunately, one of the latrine areas is on that plastic, as well as in another corner on some black plastic. Also there are feces scattered about in other places. Best I can tell, they all appear to be rather old and dried up so maybe the animal has moved on. We have never seen an entrance hole beside the duct’s sheet metal cover. The cover comes down pretty close to the soil line so we can’t figure out how an animal this large could get under it so as to go through the wall beside the duct, but that is what has happened. Is there a chance there is a tunnel someplace, coming up underneath the duct cover where we cannot see it? The cover is riveted on so it would be difficult to remove to check. As I said at first, I stuffed some plastic bags loosely in the entrance holes from the inside, and nothing has disturbed those as yet. I am hoping the fellow is gone! Where can we get safety gear to wear when we do the cleanup? We need Atlanta opossum removal. Thanks for your help!